Mozart’s Requiem and Michelangelo’s Pietà have always been enduring sources of inspiration and enlightenment despite, or perhaps because of their concern with death 2. While death remains a singularly compelling subject for artists, musicians and writers – in the face of attempts by both religion and science to cure its ‘symptoms’ and prolong our lives – the reality of it (or better the fear it produces in humankind) continually presents itself, and is human kind’s one particular common “fact”. Death, as “metaphysical or logical perplexity, as a dread of the unknown, as a confrontation with nothingness,” is our constant and most difficult companion 3. 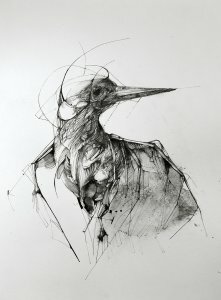 To understand Eric Lacombe’s work and its function in the context of today’s collective imagery and psyche, we need to analyze the intersection of death and consciousness. Eric Lacombe’s subjects are neither personifications nor metaphors of death, like the cranium in Skull of a Skeleton with Burning Cigarette by Van Gogh; in that painting, death masquerades as a trope of conservative academic practice 4. Neither is death merely represented as the sum of effects on a human body, as one finds in Andrea Mantegna’s Lamentation of Christ. Eric Lacombe’s aesthetic dissection of death and the consciousness of it, is perhaps best compared to James Hopkins’ Brink. Here, “a chair that seems about to fall is held in place by gravity, poised on two legs which the artist has positioned to a seemingly impossible point of equilibrium.”5 And one can also look at Lacombe’s thickly-painted self-portraits and hybrid bird-headed creatures to see they are neither alive nor dead, but rather suspended in a kind of mental fourth dimension: the perception of imminent death affects both their state of consciousness and their level of self-awareness. Although the good and the wise 6 have always been promised a satisfactory life in the afterworld – and regardless of the progress reached in modern medicine – the “matter of the soul”7 has never ceased causing people to dread the separation of their consciousness from their bodies. Thousands of years ago the Greek philosopher Epicurus tried to explain why the “dark lady” was not to be feared 8; however history shows this barely discouraged modern philosophers and scientists from either making further conjectures or sidestepping the issue altogether. 9 Artists and poets virtually free from empirical investigation methods, on the other hand, managed over the centuries to reduce death to an aesthetically pleasant version of their own fears. In tragedies, a hero’s meaningful existence is paradoxically forged by his death. Eric Lacombe’s work, too, shows a negligible anxiety about death 10 and carries with it an odd sort of heroism; one cannot discern a desire for self-awareness in these works, a realization produced by the growing consciousness of impending doom. The pain derived from the material attachment of Lacombe’s “individuals” to their own lives is accompanied by what appears to be a kind of soundless musical background that anticipates both relief and happiness. Looking at these paintings is a nearly comical equivalent of finding consolation, that is, the fact that we are alive and they’re not 11. Regardless, the artist’s palette evokes the earth and its way of silently folding the forgotten remains of every dead thing back into itself, while the beaks and feathers of his characters would suggest the flight of the soul moving in the opposite direction, that is, up. Silence in Eric Lacombe’s work is intended as a monologue, a kind of anaerobic prayer taking place within the walls of the mind, and juxtaposed to the tactile qualities of paint; here, then, is an invitation to maintain direct contact with our physical self. Below the surface of his paintings his creatures are seemingly trapped; Lacombe produces a mirror conceived to reflect our own fate. In nature as well as in philosophy, the production of sound and noise indicates that something – whatever that might be – is moving. We detect that this something is either alive or being animated by an external force 12. In music, the pause between two measures indicates and outlines a moment of reflection, oblivion and transformation. 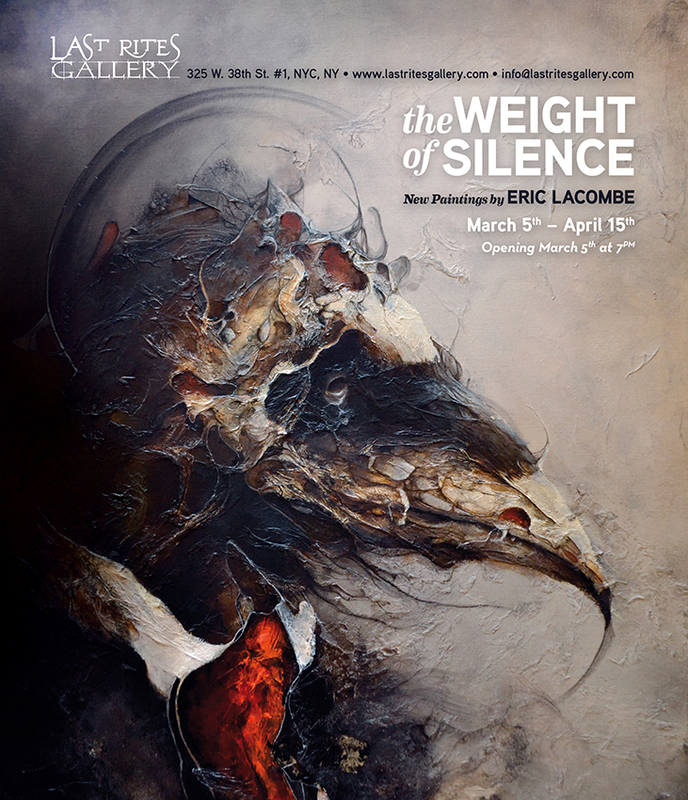 According to Eric Lacombe, the concepts of ‘life’ and ‘silence’ can only coexist in the anteroom of death. Through his art, Lacombe is neither eluding nor delaying the end, but rather “practicing dying” in the wake of Socrates and his acolytes by placing his pawns on a chessboard and playing the same strange match over and over again. The artist is trying to figure out how it would feel, with no anguish or regret, to perceive death before its occurrence. 1. Eco, Umberto. History of Beauty (p. 135). Rizzoli (2010). International Publications, Inc. 2. Parkes, Colin M., Laungani, Pittu and Young, Bill. Death and Bereavement across Cultures (p.5). Routledge (1997). 3. Malpas, Jeff and Solomon, Robert C. Death and Philosophy (p.174). Taylor and Francis (2001). Kindle Edition. 4. Frank, Priscilla. A Brief History of Artists Grappling With Loss and Death. The Huffington Post. (2015) 5. Brennan, Mike. Art of Darkness: Apocalypse, Death and Disaster in Contemporary Art. An Emerging Trend of Unease. Modern Edition. 6. “Chrysippus apparently thought that the souls of wise persons persist (as fine, imperceptible corporeal structures) all the way to the next conflagration in the cosmic cycle, whereas the souls of other people last for some time, and then get dispersed.” Lorenz, Hendrik. Ancient Theories of the Soul. The Stanford Encyclopedia of Philosophy. Edward N. Zalta (2009); “Being acquainted with nothing but their own virtues, they tend to welcome those who are similar to them while treating everyone else like a stranger.” Epicurus. Opere (Classici della Religione) (Italian Edition) (Kindle Locations 4166-4168). UTET (2013). Kindle Edition. 7. Plato. Meno and Phaedo (Cambridge Texts in the History of Philosophy) (Kindle Locations 1860-1861). Cambridge University Press (2010). Kindle Edition. 8. “The worst evil (death), is nothing to us because when we are here, death is not, and when it takes over, we are no longer here.” Epicurus. Opere (Classici della Religione) (Kindle Locations 4174-4175). UTET (2013). Kindle Edition. 9. “If death is defined as the “end” of Da-sein, that is, of being-in-the-world, no ontic decision has been made as to whether ‘after death’ another being is still possible, either higher or lower, whether Da-sein “lives on” or even, “outliving itself” is ‘immortal’.” Heidegger, Martin. Being and Time (p. 230). State University of New York Press (1996). 10.“I must now clarify the nature of mind and soul and drive away that fear of Acheron headfirst — it utterly disturbs the life of human beings at its foundation, filling all actions with death’s black darkness, leaving no pleasure clean and free of stains.” Lucretius. On the Nature of Things (p. 88). Richer Resources Publications (2012). Kindle Edition; “If we ask further what the object of anxiety is, then the answer must be that here as everywhere it is nothing. Anxiety and nothing always correspond to each other.” Kierkegaard, Soren. The Concept of Anxiety: A Simple Psychologically Oriented Deliberation in View of the Dogmatic Problem of Hereditary Sin (Kindle Locations 1865-1866). Liveright (2014). Kindle Edition. 11. “As Aristotle noted in his Poetics, people are fascinated with scenes of death and in fiction they are content to see things they would prefer to avoid in their own lives. The culture of spectacles was firmly rooted in the Roman Empire, which was preoccupied with gladiatorial combats and other ‘pleasurable’ visual cruelties, with the gladiator’s death being the entertaining climax of such events.” Outi Hakola and Sari Kivistö. Death in Literature (p. VII). State University of New York Press (2014); “We cannot, indeed, imagine our own death; whenever we try to do so we find that we survive ourselves as spectators.” Freud, Sigmund. Reflections on War and Death (Kindle Location 232). Vook, Inc. (2012). Kindle Edition. 12. “Let the foregoing suffice as an analysis of sound. Voice is a kind of sound characteristic of what has soul in it; nothing that is without soul utters voice, it being only by a metaphor that we speak of the voice of the flute or the lyre or generally of what (being without soul) possesses the power of producing a succession of notes which differ in length and pitch and timbre.” Aristotle. On the Soul (Centaur Classics) (Kindle Locations 765-768). Centaur Editions (2015). Kindle Edition.